2013 VW Golf GTI and estate at Geneva | What Car? Production versions of the Volkswagen Golf GTI, GTD, Bluemotion and Estate will all appear at the Geneva motor show next month. The Golf Estate is bigger than the outgoing model, with 100 litres more boot space than before it now offers 605 litres with the seats in place and 1565 litres with everything folded down. Volkswagen says that it will come with the same trims as the Golf hatchback, with S, SE and GT trims at launch. The entry-level engine will be the 104bhp 1.2-litre petrol. Prices havent been confirmed, but theyre expected to be around the 18,595 of the outgoing car. 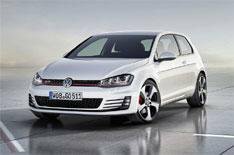 The Golf GTI will be near-identical to the concept car shown at the 2012 Paris motor show. It will come with a 217bhp 2.0-litre turbocharged petrol engine, which is around 10bhp more than the current GTI. This will translate to a 0-62mph time of 6.5 seconds and a top speed of 153mph. It will come with a six-speed manual gearbox as standard, while a six-speed DSG semi-automatic box will be offered as an option. The manual version will average 47.1mpg and emit 140g/km of CO2. Prices are expected to start around 25,600. The most economical version of the Mk7 Golf the Bluemotion will come with a claimed average economy of 88mpg and a CO2 figure of 85g/km. Itll be powered by a 108bhp 1.6-litre diesel engine and is expected to cost from around 19,430. The GTD is powered by a 181bhp 2.0-litre diesel unit, with a claimed average economy of 67mpg and a CO2 figure of around 112g/km with the manual gearbox. The DSG semi-automatic gearbox will push emissions to around 123g/km, and average economy drops to 61mpg. Performance figures havent been confirmed, but its 0-62mph time is expected to be less than 8.0 seconds, while top speed will be around 140mph. The GTI will be the first of the four cars on sale, arriving in May. The GTD and Bluemotion are both expected in July, while the estate wont go on sale until September. Final performance figures and prices will all be confirmed closer to the cars' launch dates.